King Kartel are here to drench these drizzly days in a wave of nostalgia for early nineties Brit-pop, when any bunch of lads with the right amount of swagger could pick up guitars and pick up a record deal with ease. And surely the baggy revivalism of Kasabian, Reverend And The Makers and The Pigeon Detectives must have been at the forefront of King Kartel's minds as they set their sights on studio sessions and perfecting the cutting-edge sound of lad-rock. Perhaps you've just read all of that in a derogatory tone, and even in my own mind the jury is still out on whether they are worthy of my attention, it seems that a straight up band, playing instruments, with no gimmicks, no agenda, and no unique selling point are horribly out of favour, and this is where the debut EP snaps me straight out of these current trends. Four tracks very quickly lay down the bands intent, opener 'Aftershock' is out of the traps at a breakneck speed and rattles along with an absolute furious pace and 'All Talk, No Trousers' struts with an aggro-menace and Liam Gallagher-esque snarl that must surely see these lads landing themselves some Beady Eye support slots in the near future. Closing track 'Shine On Me' could quite easily have been snatched from Noel's pile of whimsical Oasis B-side ideas and stands strong, but it is 'Not Done Fighting', the EP's title track, that has rousing arena aspirations written right through it, with a stripped back sound ideal for encouraging mass clap-alongs and a sentiment that should unite grown men in beer-splashed hugs. 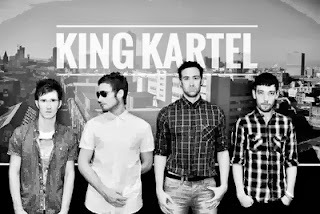 King Kartel's identity may certainly be nothing new, but their knack for knocking out a decent tune should garner them enough attention to break out of toilet venues and start making a few friends and fans in higher places. Stream the 'Not Done Fighting' EP in full above. Purchase at Bandcamp.